The deserted city of Fatehpur Sikri was the capital of the Mughal Empire between 1570 and 1585. It was built under the personal supervision of the Emperor Akbar. The story goes that the emperor was childless and, having tried all sorts of solutions to his plight, visited a Sufi saint, Sheikh Salim Chishti, for help. Soon a son was born, and - impressed and overjoyed - Akbar started building on the site where he had met the saint. However, due to a severe shortage of water the city was abandoned after only fifteen years, and the capital was relocated back to Agra. As a result, Fatehpur Sikri stands untouched and perfectly preserved: a complete medieval fortress built of red sandstone, with vast central squares, exquisitely carved multi-tiered pavilions, cool terraces and formal gardens. It is best to hire a guide, or do some research before visiting, because the site is hugely enriched by some knowledge of its fascinating history and the many stories that have accumulated about the place. Visitors can walk freely around the vast complex admiring the intricate architecture and carvings and imagining how the royal family once lived. The gardens are also lovely and well-maintained. 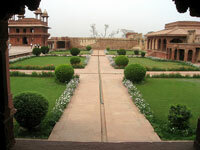 Address: Fatehpur Sikri is a 25-mile (40km) journey west of Agra, on the way to Jaipur.